In this post, we’ll share our review of the two top-selling EnviroKlenz Mobile Air Systems. EnviroKlenz has created an air purifier specifically inspired by their Customers with Multiple Chemical Sensitivities (MCS). By working closely with those suffering from MCS, they were able to create an air purifier that is both effective and safe for everyone – especially those with illnesses that are triggered by environmental exposure. EnviroKlenz not only has worked closely with those suffering from MCS but have also partnered with numerous naturopathic doctors throughout the country to provide their patients with a solution to their indoor air quality issues – whether that be those suffering from allergies, asthma, autoimmune diseases, or any kind of severe sensitivities. In this review, we’ll provide information on both EnviroKlenz Mobile Systems by showing you the similarities and differences between the two products as well as how the EnviroKlenz technology compares to the major competing technologies used in air purification. EnviroKlenz is unlike any other air purification technology on the market. The EnviroKlenz patented “Adsorptive Neutralization” technology provides effective elimination of odors and chemical pollutants in the pursuit of Personal Environment Protection for Everyone. What makes the EnviroKlenz technology so unique is the benefit of a more effective chemical neutralization process that presents no concerns of harsh chemicals utilized in the process. The EnviroKlenz technology utilizes advanced, patented materials (earth minerals) to safely neutralize a broad spectrum of toxic and noxious chemicals and odors present in the environment. The EnviroKlenz earth mineral blend (Magnesium Oxide, Zinc Oxide, & Titanium Dioxide) have a high surface area that becomes reactive against a broad spectrum of chemical pollutants that come into contact with the active site. Additionally, these minerals break down the chemicals through a variety of chemical mechanisms and pathways, ensuring no chemicals will be re-released back into the environment after going through the EnviroKlenz patented process. 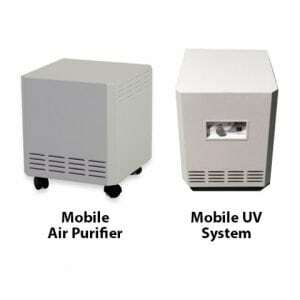 The Mobile Air Purifier and Mobile UV Air System share a lot of features in common. This makes it easy to compare these two EnviroKlenz products because you know you’re going to get certain functions no matter which device you buy. 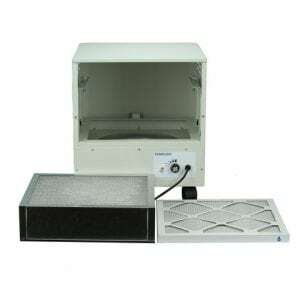 A hospital-grade HEPA filter – This captures harmful dust, particulate allergens, pet dander, microorganism, and more that are larger than 0.3 microns in size. 1,000 square feet of coverage – This makes both units perfect for home and office use. 4 speed controls – This allows you to adjust the power of the blower. The low setting is near silent while still maintaining high efficiency. Fortunately, there’s only two differences between the EnviroKlenz Mobile Air Purifier models. Ultraviolet Germicidal Radiation (UVC) lights – These UVC lights have the ability to kill microorganisms like airborne viruses and bacteria that collect on the HEPA filter. The UVC lamps are located before the collection side of the HEPA filter – allowing the UVC light to continuously shine on the collected organisms with a high efficiency of kill. Replacement Indicators – These small LEDs will become illuminated to alert you to when it’s time to replace the UVC lamps and/or HEPA filter. 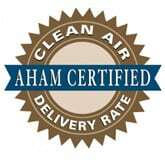 Today, many air purifiers utilize either of the major technologies available such as carbon, ozone, ionizers, and PECO. EnviroKlenz, however, does not utilize any of these technologies, as it uses their own proprietary technology called, “Adsorptive Neutralization”. Carbon utilizes a solid sorbent, which captures air pollutants by means of physical adsorption. Once these filters become full – due to the limited removal capacities & often no destructive capabilities – chemical contaminants will be released back into the environment. Some air purification systems will even use activated carbon in their filtration process. Activated Carbon is a form of carbon that has undergone a process – the addition of Potassium Permanganate – to make it extremely porous and give it the ability to have a high surface area for adsorption. Even with this porous surface, the activated carbon cannot destroy the chemical contaminants and often times will result in the re-releasing of these pollutants back into the air. Whereas the EnviroKlenz technology puts nothing into the atmosphere and draws everything into the “Adsorptive Neutralization” technology – the first-stage filtration, EnviroKlenz Air Cartridge – where it is destroyed with no potential for re-released contaminants in the air. 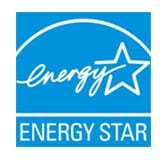 Ozone is a very effective method for eliminating odors and has been used for many years. It is a large machine that produces ozone and cannot be operated in occupied spaces. Ozone releases an unstable molecule consisting of three oxygen atoms. Although this process is effective at eliminating the odors and chemicals in the environment, it can lead to potential negative health effects for those exposed. The O3 is considered an air pollutant and has potentially harmful effects on the respiratory system. 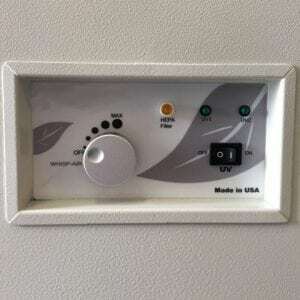 Instead of a harmful chemical compound being released for the elimination of these chemicals and odors, the EnviroKlenz technology will not only break down and neutralize the chemical compounds but will do so without the use of any harmful chemicals being released or re-released back into the environment. Ionizers work by emitting electrically charged ions into the environment to latch onto chemical molecules, thus bring them to the ground. This is very ineffective against most Volatile Organic Chemicals (VOCs) because often times the size of the molecules are much larger than the VOCs present in the air. VOCs encompass a wide range of compounds that require different methods of destruction to completely be eliminated. The EnviroKlenz technology is capable and effective at removing and destroying a broad spectrum of VOCs utilizing the proprietary blend of earth minerals using a patented process. The Molekule technology, PECO (Photo Electrochemical Oxidation) claims to eliminate pollutants at a microscopic scale including VOCs and viruses in the air. It does this through the use of free radicals that oxidize the pollutants in the air which is triggered by a light-activated catalytic reaction that allows for pollutants to be broken down. This reaction has been proven as an ineffective method against inorganic and organic molecules with halogen, sulfur, and phosphorous, and will ultimately end in the release of a chemical byproduct emitted into the environment. The EnviroKlenz technology, in comparison to the PECO technology, is more efficient at eliminating the source of the chemical and odorous issues in the indoor air environment through the patented technology process incorporated into the EnviroKlenz Mobile Air System. Also, the EnviroKlenz technology is based on the use of safe earth minerals that do not release any chemical byproducts into the environment.